Most people have never heard of the Ariège – and that includes most French people – which means that very few people have ever tasted an Ariège wine despite the fact that the region now occupies the top spot for organic winegrowers in France, making up 25% of the total. However, the wines of the Ariège still tend to be ignored because the number of vineyards is minimal and the production is very low so it is actually very hard to get your hands on a bottle of wine from the Ariège. At the end of the 19th century, there were 20,000 hectares of vines in the region but thanks initially to industrialisation and depopulation followed by Phyloxia and World War 1, the vines were gradually abandoned until by 1979, there were just 2000 hectares of vines under cultivation and today there are fewer than 100 winemakers in the region. We were recently lucky enough to meet the charming Philippe Babin, one of the best-known organic wine producers in France, who produces the delicious Côteaux d’Engraviès. His vineyard is situated in little village of Vira to the east of Foix in a beautiful pocket of rolling hills tucked below the higher peaks of the Pyrenees. He started growing vines in 1998 on land which had never been treated with chemicals and thus was able to secure a subsidy to grow and produce organic wine. He took us on a fascinating tour of his vineyards and is an eloquent and entertaining host, clearly with huge passion for his wine and immense knowledge which he is happy to share. He insists that it is perfectly feasible to produce delicious wine organically and argues that it is only by growing without chemicals, that it is possible to get the true flavour of the grapes and the ‘terroir’; that all important hidden ingredient in every wine – the flavour provided by the land and position on which the grapes are grown. 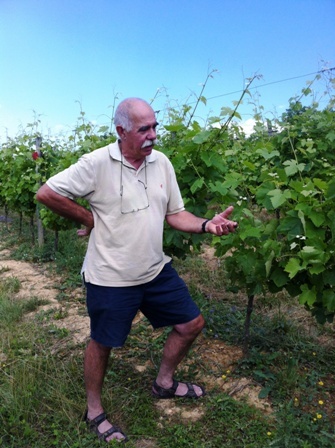 He also points out that the Ariège is a magical area for wine because it sits on the climatic cusp between the Mediterranean and Atlantic with influences from both, as well as from the mountains and thus he is able to use both traditionally Mediterranean grape varieties and traditionally colder climate varieties from the Atlantic region to create a truly special and unusual wine.